This entry was posted on September 8, 2013 at 8:00 pm and is filed under Crime, Drama, Romance, Western with tags 2013. You can follow any responses to this entry through the RSS 2.0 feed. You can leave a response, or trackback from your own site. Great review mark. I quite like the sound of this one, despite the flaws that you point out. I’ll still give it a go but I will go in with trepidation. You have to be seeking a purely sensory experience. It holds the potential to be among the best of the year for the right viewer. Hmmm! Interesting! As a fan of Malick and the like, I want to see this even more now. Nice review Mark. I really liked this film. Not because it was pretty, but because it had an actual story, with characters I could actually give a flying hoot about. The story was pretty conventional. I cared about the characters too, but because of the natural performances from the actors. 90% mood, 10% story was how I saw it. I did like this movie, but the mood was a little too mellow and calm. The subject matter should have called for more excitement. 3 stars also. P.S. I also think the title was bad. It did make me laugh though. Most incomprehensible title since Quantum Of Solace. Man I wish I could write like you. I know you mentioned this on Facebook for some Ben Foster love and I have been interested in seeing it for awhile but your review makes me want to rent it. Sounds good, just nothing worth really going out of my way for. And when is Rooney Mara going to play a woman who DOESN’T kill/shoot someone? I hope I didn’t undersell the performances. Everyone is really good. Since you’re a big fan of Ben Foster, you might enjoy this even more, although his part is kind of small. Nice review. I’ve read the Malick comparisons before, which I why I’m excited into seeing this film. I’m sure you’ll agree when you see the film. The Malick comparisons are inescapable, they’re so obvious. Nice review. I’ve read similar points of view on this one but I’m still pretty excited to see it. Love Affleck, Mara and Foster. I was a bit more cautious in my praise. Many reviews are quite glowing. Interesting review. When I started reading it, I assumed you didn’t like the movie. Then next paragraph meant you liked the various character sketches (still I assumed you weren’t crazy about the film). And Bang!! ‘stunningly beautiful film’. I liked Badlands when I watched it about a decade ago. Am yet to watch this unusually titled seemingly good movie. For everything that this film has going for it, that title is not one of them. It didn’t hurt my enjoyment of the movie although my feelings kind of vacillated as I watched. Overall, I recommending it though. It’s too memorable to dismiss. Excellent Review. While I was blown away by the style and score I was left felling a bit empty by the end. While it is reminiscent of Malick’s early work I still think it presents a director still finding his feet. For me, too little time was invested in setting up and solidifying the relationship between the two leads at the beginning for me to be lost in the romance and journey that was unfolding. I do however feel that David Lowery is most certainly one to watch. I completely agree. Badlands and Days of Heaven are more accomplished. But as you point out, there is much potential here. Looking forward to seeing what Lowry does next. Have yet to see this one yet Mark, but it is on my want to watch list for sure. I do enjoy me some Casey Affleck. 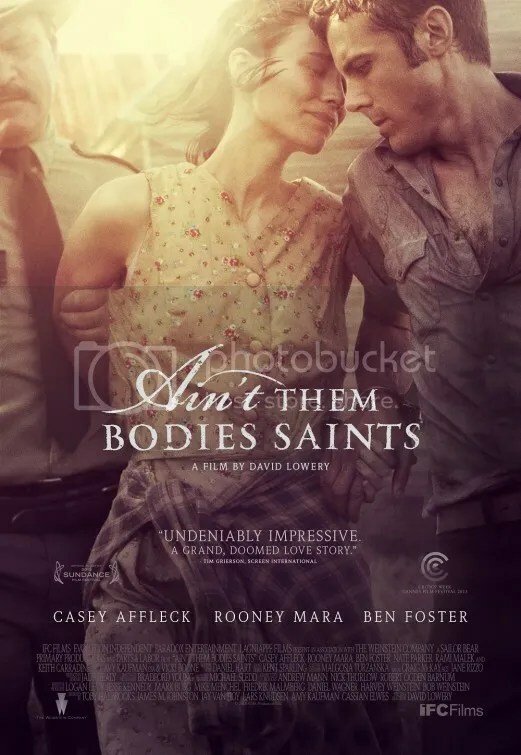 It’s a very poetic film and Casey Affleck fits the mood perfectly. Great review. I am actually looking forward to seeing this one, and I think this unusual title makes me even more so. When I saw the film, I didn’t know the story behind the title and so I kept trying to figure out what it meant while I watched. “Easy to admire, hard to enjoy”. Spot on Mark. That phrase is a little overworked. I’ve used it before, but it applies so perfectly here. Sounds pretty and seems like there are good performances, but based on your review, I’m not sure I’d enjoy it. Most often, I don’t care for films where style trumps substance. Occasionally there are exceptions, although I don’t think this would be one of them for me. As a film buff, you should definitely check it out. It has gotten some raves. I finally saw this, so I looked up your review. I agree on many points, especially as to its beauty. I think I like it a bit more than you do, though because I think the characters a bit more interesting than you seem to. They don’t really change, at least not fundamentally, but they do, I think, develop. The narrative is certainly lite. I sympathize with your feelings. I don’t hold strong opinions on this film. I’ve heard people say they love it and others say they hate it. I completely understand both sides. So do I. My opinion is fairly strong (I gave it a B, the same grade I gave, say, Captain Phillips), but I don’t actually love it. I’m somewhere in the middle, leaning (heavily) to the positive.